Originating in the north-west regions of present-day Pakistan and Afghanistan, the art of Gandhara represents a unique meeting of East and West. From these sources there emerged a remarkable new art that flourished during the first four centuries of the current era. This figure of a Maitreya is distinguished by its quiet and contemplative attitude, the distinctive face with prominent moustache, the flowing drapery, the ornate pedestal, and the right foot casually raised leaving an empty sandal on the footstool. The right hand lightly touches the head in a pensive gesture, and the left holds a covered water bowl. 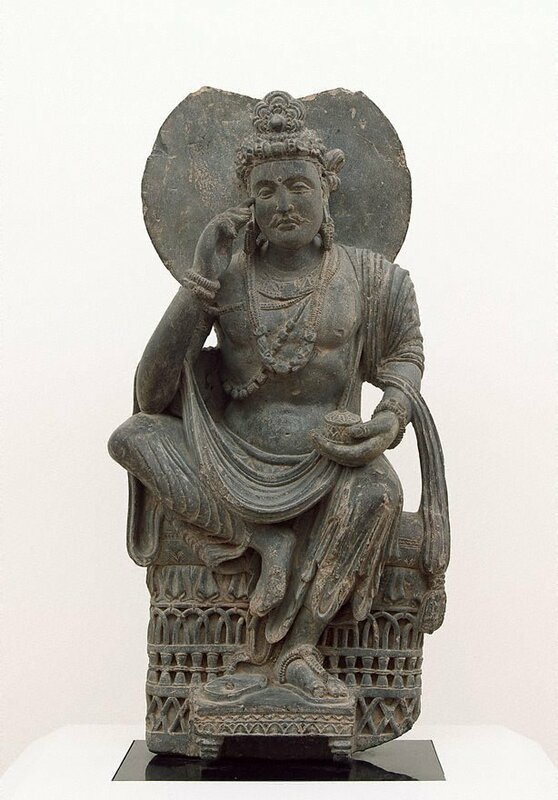 It is an image that beautifully and richly embraces its cosmopolitan heritage and lays the foundations for the great traditions of East Asian Buddhist sculpture. Julian Sherrier, pre 1997, London/England, purchased by the Art Gallery of New South Wales, Sydney, 1997.